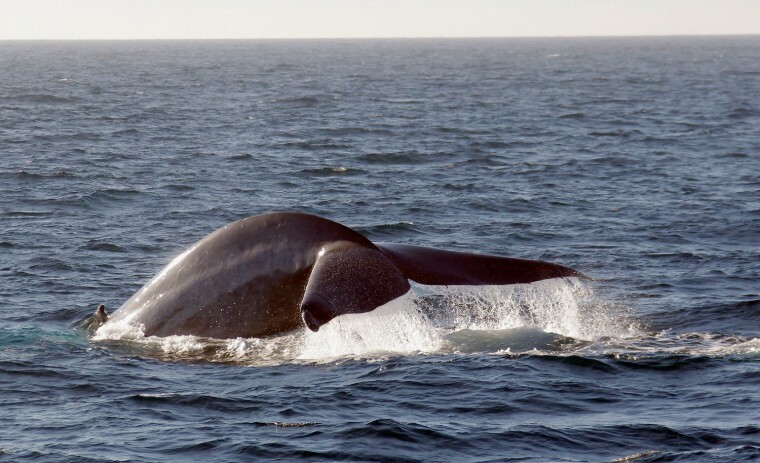 From a fetid, foot-long rod of earwax, extracted from the skull of a dead blue whale, scientists have unspooled an in-depth life story of one member of the largest mammals on earth. These waxy diaries could give marine biologists a new way to study the lives of a free-swimming species, and a window into the health of the ocean at large. "It might be the only life history of any free-ranging animal," Stephen Trumble, a marine biologist at Baylor University, told NBC News. Each year, as the whale's ear lays down a new layer of fats, native and foreign chemicals in the marine mammal's body are archived with it. "It's keeping a journal," said Trumble. The 10-inch plug, recovered from a 12-year-old male whale that beached on the California coast in 2007, looks like a piece of striped bark, but feels firm, like a candle. Twenty-four alternating bands mark six-month phases of a whale's life, alternating between feeding and fasting seasons. And it smells ... "Oh my gosh, I can't even explain it," Trumble said, "They smell terrible." Marine biologists have estimated that blue whales hit puberty between the ages of 5 and 15, but thanks to the earplug, Trumble and company have a clearer marker for the first time. This animal reached puberty at 9 years and a few months, they explain in a study in the Sept. 16 issue of the Proceedings of the National Academy of Sciences. At that age mark on the earplug, the researchers saw a spike in testosterone levels, followed quickly by a spike in cortisol, a hormone released when an animal is stressed. "I saw that and I just chuckled," Trumble said. "It was mixing with the big guys trying to mate, and probably getting a rough time from the other males." Also, in the first months of its life, this whale was exposed to unusual levels of pollutants, the earplug record showed, confirming that baby whales absorb toxins from their mothers while they're in the womb. The chemicals trapped in the earwax also indicate the quality of the environment that the whale is swimming in. The researchers noted a spike in mercury levels that suggested that the whale encountered a polluted patch of ocean during a few months of its life. Since blue whales cover thousands of miles of ocean during their lifetimes, they witness more of the ocean than researchers can ever hope to see — let alone study. "The large whales ... you can't ask for any other kind of steward to let us know what's going on." It's like a "really large canary." The earplug method's been so successful, Trumble and his colleagues are already making plans for their next conquest. "We have a female earplug from 1964 we're really excited about," he said. The chemical signatures could indicate how many calves the whale had, and at what age she gave birth to them. And at museums across America, hundreds of earplugs are waiting to be decoded — the Smithsonian alone has over 400 plugs from fin, sei, humpback and gray whales in its collection. If all goes well, the earplugs will provide a rich (if stinky) account of our changing ocean, not to mention decades upon decades of whale tales. Stephen Trumble, Eleanor Robinson, Michelle Berman-Kowalewskic, Charles Potter, and Sascha Usenko are authors of "Blue Whale Earplug Reveals Lifetime Contaminant Exposure and Hormone Profiles," published in the Proceedings of the National Academy of Sciences.